The Piper Cub's military use was really quite extensive, though little has been written about it. It quickly became a familiar sight wherever US forces were in action or based. First Lady Eleanor Roosevelt took a flight in a J-3 Cub, posing for a series of publicity photos to help promote the CPTP. Newsreels and newspapers of the era often featured images of wartime leaders, such as Generals Dwight Eisenhower, George Patton and George Marshall, flying around European battlefields in Piper Cubs. Civilian-owned Cubs joined the war effort as part of the newly formed Civil Air Patrol (CAP), patrolling the Eastern Seaboard and Gulf Coasts in a constant search for German U-boats and survivors of U-boat attacks. Piper developed a military variant ("All we had to do," Bill Jr. is quoted as saying, "was paint the Cub olive drab to produce a military airplane"), variously designated as the L-4, O-59 and NE-1. The variety of models were collectively nicknamed “Grasshoppers” and were used extensively in World War II for reconnaissance, transporting supplies and medical evacuation. L-4s were also sometimes equipped with lashed-on infantry bazookas for ground attack. Mechanically identical to the J-3, the military versions were equipped with large Plexiglas windows extending over the top of the wing and behind the rear-seat passenger, and the side windows were enlarged. 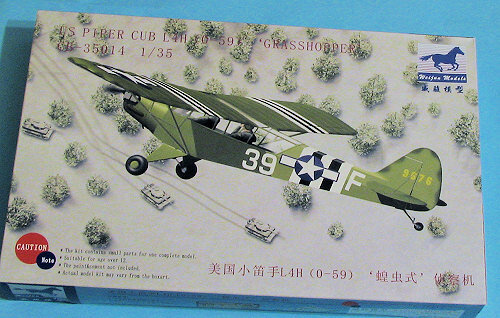 The Grasshopper was so influential to ground battles and the war that the Luftwaffe awarded twice as many "points" towards combat medals for Cub kills as they did for Allied fighter aircraft. In Europe, the final dogfight of WWII occurred between an L-4 and a German Fi-156 Storch. The pilot and co-pilot of the L-4, Lts. Duane Francis and Bill Martin, opened fire on the Storch with their .45 caliber pistols, forcing the German plane to land. This was also the only known instance of an aircraft being downed by pistol fire during the war. I'm thinking these are the same people as Bronco models and from what my armor friends say, the tanks are superb. This comes in the usual sturdy box that seem normal with Chinese kits. There are four sprues and each is individually bagged. 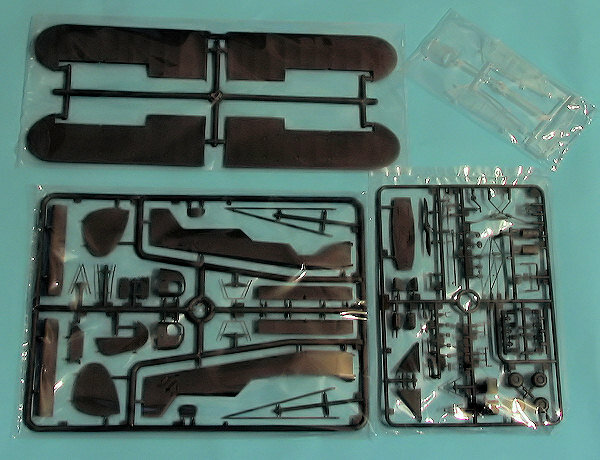 There is a lot of extra space in this box as the aircraft kit isn't that big, and in fact, seems that it will be about as large as a 1/48 Bf-109 when done. A look at the sprues shows that these folks have really done a fine job of molding the kit. The surface detail is one of the best representations of fabric I've seen and though there are some 'hills and valleys', they aren't that bad. Of course, having been around quite a few fabric covered light planes in my life, I did notice that the fabric was a bit taughter than what's in the kit, but we all know that kit molders will take artistic license on things. The wood representation on the floor is also quite noteworthy. The kit is without flash of any kind and even the mold seams are quite small. There are ejector pin towers and marks that will have to be either removed or filled, but none of these is on the outside of any part. A few of the small, thick pieces had some sinkage. Clear parts are quite well done and have the sprue attachment points along the edges of the parts. As you would expect, the detailing is most complete with no area left un-detailed. There is even a section on the clear sprue for the hold down bolts that go around the windscreen. Apparently one removes the individual bolts and glues them in place. The engine is also quite complete, though not all will be visible through the cowling. It would have been nice to have removable cowling panels, and while I'm sure this won't be difficult to do, most will simply glue the two side halves together. The ailerons are separate and while I'm not sure if they are designed to be moveable, that does seem possible. A photo-etch fret accompanies the kit for things like radio gear, harness buckles (yes, you have to make your own harness), and a few other detail bits. In all, things seem quite scale and the p-e is appropriate for what it represents (as in it isn't used for round stuff). Instructions are in both Chinese and English and consist of a 12 page booklet in rather stiff paper. The large construction steps are quite easy to read and understand. A few funny instructions "glue nuts to the windscreen" bring a chuckle but otherwise should present no problem. 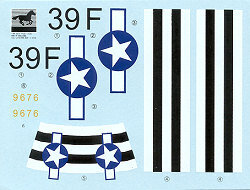 The decal sheet is for one aircraft as shown on the box art. The decals are a tad thick (sort of like older Hasegawa decals) and are really quite well printed. Thanks to the rather flat surfaces on which they will fit, it may well be possible to successfully use the invasion stripes supplied. Not sure if this kit will elicit any response from the decal makers, but it would be nice if it did as though plain, there are a number of possible markings options out there. I'm also not sure if medium green is the shade to use, but one isn't sure as there are absolutely no painting instructions of any kind supplied. One has to assume that the inside is interior green with perhaps OD seats and perhaps a black painted wood floor, but I certainly couldn't tell you. OK, so you are probably wondering if this kit is worth $45.00. Well, I couldn't answer that for you as it depends on how your financial situation might be and how much you want a 1/35 scale Cub. I can tell you that by looking at the sprues, things certainly look quite promising as the molding is first rate. Only building will tell for sure. The Internet in general and Wikipedia specifically.